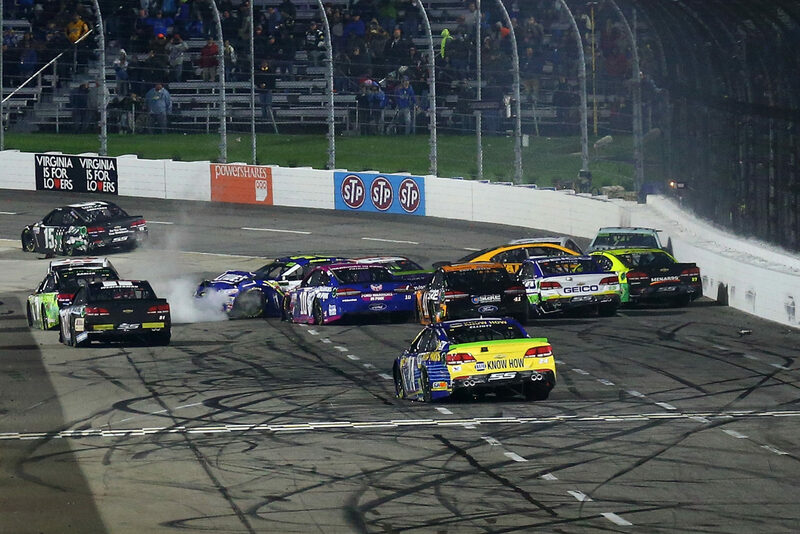 Start your engines and watch for the green flag, because Martinsville Speedway is heading into its 72nd season, and 70th as a foundational track on the NASCAR circuit. Known as the “Paperclip” and “the Half-Mile of Mayhem,” Martinsville hosted one of NASCAR’s eight Strictly Stock races in 1949. That marked the first year of what’s known today as the Monster Energy NASCAR Cup Series. 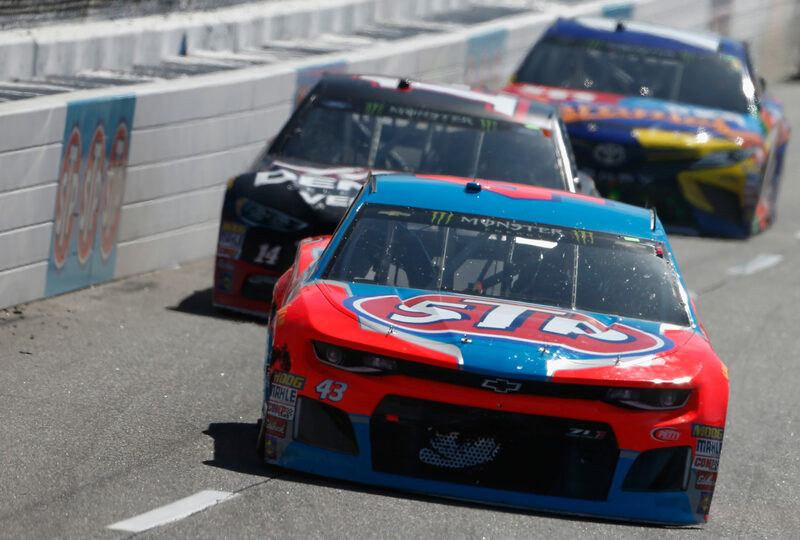 NASCAR returns to Martinsville for a weekend of racing that culminates on Sunday, March 24, for the STP 500, its spring Monster Energy NASCAR Cup Series race at the track. 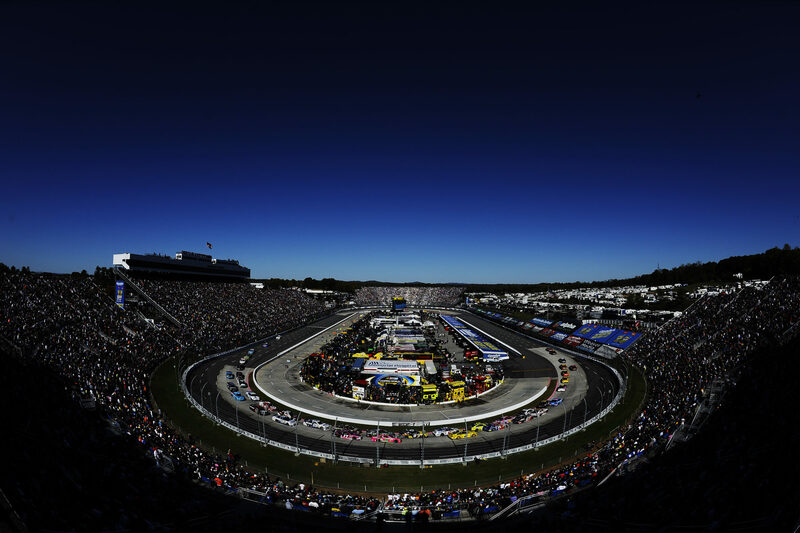 NASCAR’s fall Martinsville race, the First Data 500, is scheduled for Sunday, October 27. The Southside Virginia track’s unique shape and the intensity of the racing there makes it stand out amid a crowd of super speedways. NASCAR fans love Martinsville for its unique style of racing. H. Clay Earles carved Martinsville Speedway out of Henry County clay in 1947. He opened on July 4 of that year with just 750 seats but a crowd of over 6,000 fans. Future champion, legend, and NASCAR Hall of Fame member Red Byron won the first race. Two years later, Martinsville hosted the sixth race in NASCAR’s first series. It quickly became a fan favorite for its unique layout: two 800-foot straightaways hooked together by short, tight and almost flat turns with just 11 degrees of banking. The demanding layout consistently produces some of the wildest racing each season. Other than being paved in 1955, the track configuration has consistently remained the same. Just about everything else has changed, however. In 1976, the turns were repaved with concrete. Nearly three decades later, in April of 2004, a large chunk of concrete became dislodged and damaged Jeff Gordon’s car. As a result, the track was repaved with new concrete and asphalt. The mayhem for which Martinsville is known has been present pretty much from the beginning, as have the legendary names. In 1951, only four cars were running at the finish, the fewest of any race ever held at the speedway. Then-22-year-old Richard Petty became the youngest winner at Martinsville in 1960. Petty still holds the record for the most wins at the track, with 15. In 1991, 51-year-old Harry Gant became the oldest winner. 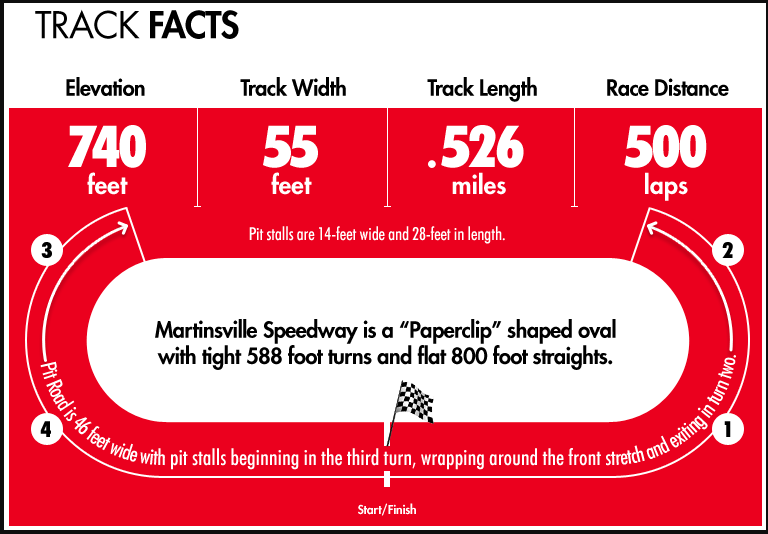 Martinsville was long known for having two pit roads, which led to a competitive imbalance in terms of how pit stops worked during cautions. In 1999, the pit road was reconfigured to extend from the entrance of turn 3 to the exit of turn 2, allowing a garage to be built inside the track. Additionally, the infield houses a top-flight care center at one end and a modern media center in the middle. The speedway added a pedestrian tunnel beneath the fourth turn a few years ago. In 2017, the track added a state-of-the-art LED lighting system. Then, last year, atop the suites in turns one and two, it opened the Skydeck, which offers one of the best views in all of racing, along with grandstand tickets, food, drink and pre-race live music. The stands around the track have grown, too. Today, 60,000 seats reach skyward from the edge of the racing surface, topped by VIP Suites and a state-of-the-art press box. Martinsville Speedway was purchased by International Speedway Corporation in 2004. But Earles’ grandson, W. Clay Campbell, who has been the track’s president since 1988, carries on the family tradition. That very first NASCAR race at Martinsville in 1949 took place in the heat of July. Beginning the following year, the track has hosted two top-tier races. In the process, it has become NASCAR’s oldest, continuously running track. Drivers look forward in anticipation—and maybe a little fear—to running the paperclip track twice a year. That was the case for drivers in the Grand National Division (1950-70), the Winston Cup Series (1971-2003), the Nextel Cup Series (2004-2007), the Sprint Cup Series (2008-2016), and, since 2017, the Monster Energy NASCAR Cup Series. Sunday’s STP 500 makes the 141st points race in the series at Martinsville. 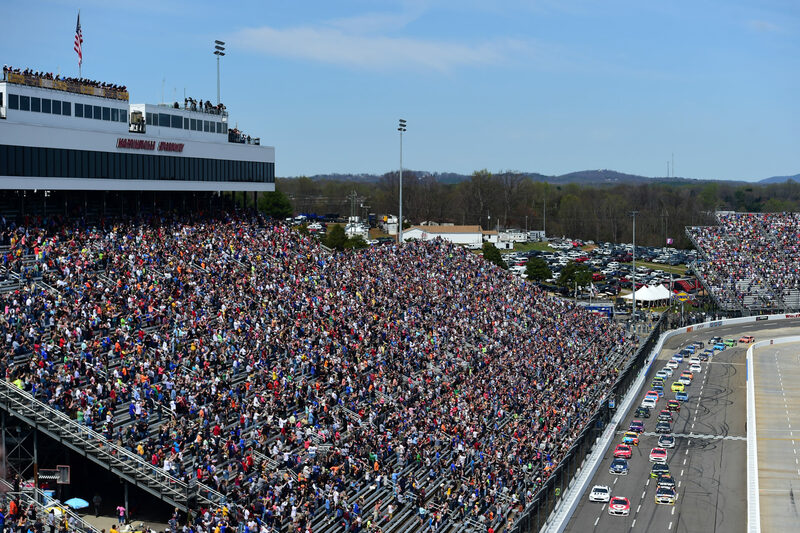 Like the first robin, the first frogs, or the first trout lilly, that first race each year at Martinsville marks the coming of spring. © 2019 Dan River State Crossings, a coalition of local businesses and proud citizens of the Dan River Basin.